Many of you know my story by now. 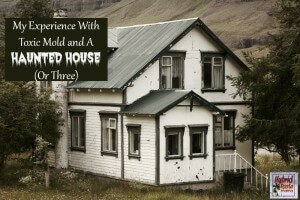 The one where I had to walk away from everything I owned because toxic mold invaded my house. As such, mold prevention and mycotoxin removal have become a regular part of my existence. 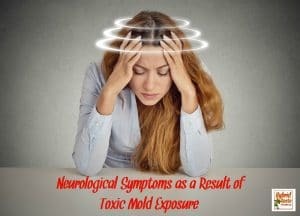 Toxic mold exposure made me a very sick person. It darn near ended my life. It has caused permanent damage to my body, my immune system, and my brain. 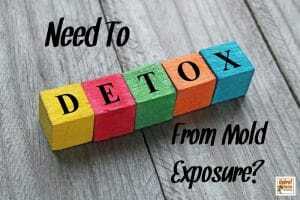 Being re-exposed to toxic mold and it’s evil offspring, mycotoxins, isn’t something I can afford to let happen. Therefore, like clockwork, I execute my monthly mold prevention and mycotoxin removal routine. I am sharing my secret with all of you today because my routine has worked incredibly well! 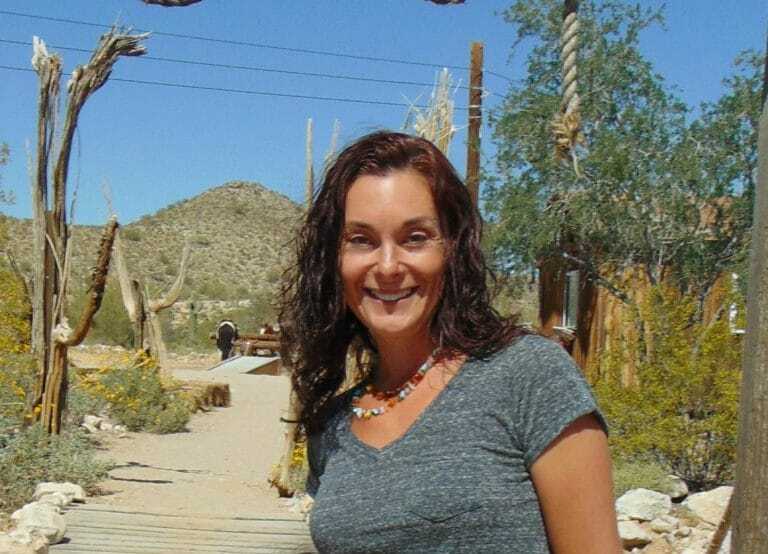 I feel great, my home environment has stayed healthy and I kept the levels of mold spores and mycotoxins at bay. This simple, cost effective routine takes me about one hour once a month…a small time investment for your health right? Mold prevention requires two products. Two. That’s it. 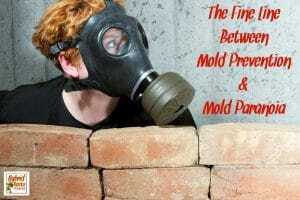 One is the mold prevention solution and the other is the delivery system. You can’t beat the simplicity in that. Let’s take a look at the products I use and how I make the magic happen! 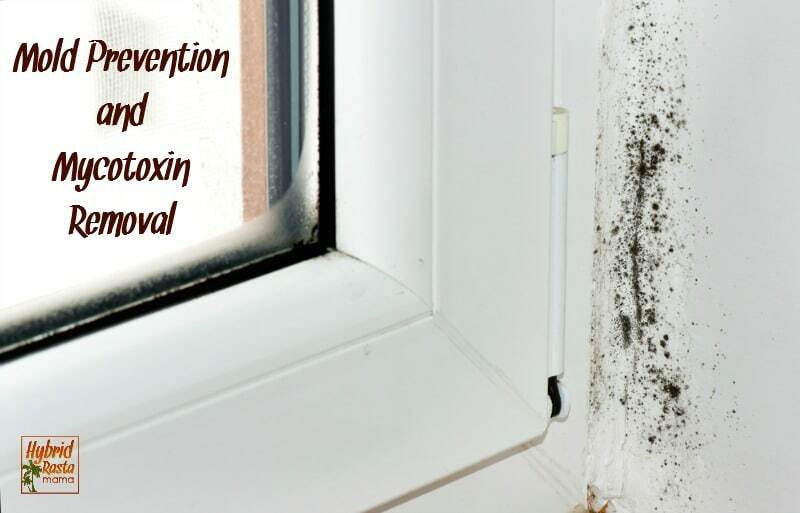 In order to keep the mold spore count down in your home, office, car, etc… you will two items. EC3 Mold Solution Concentrate and a Portable Fogger. 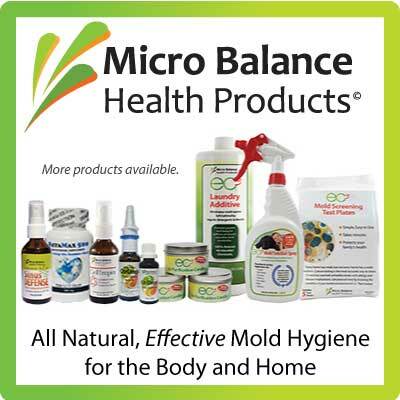 is an all-natural botanical solution that, when mixed with distilled water, can be used to maintain a mold- and bacteria-free home. 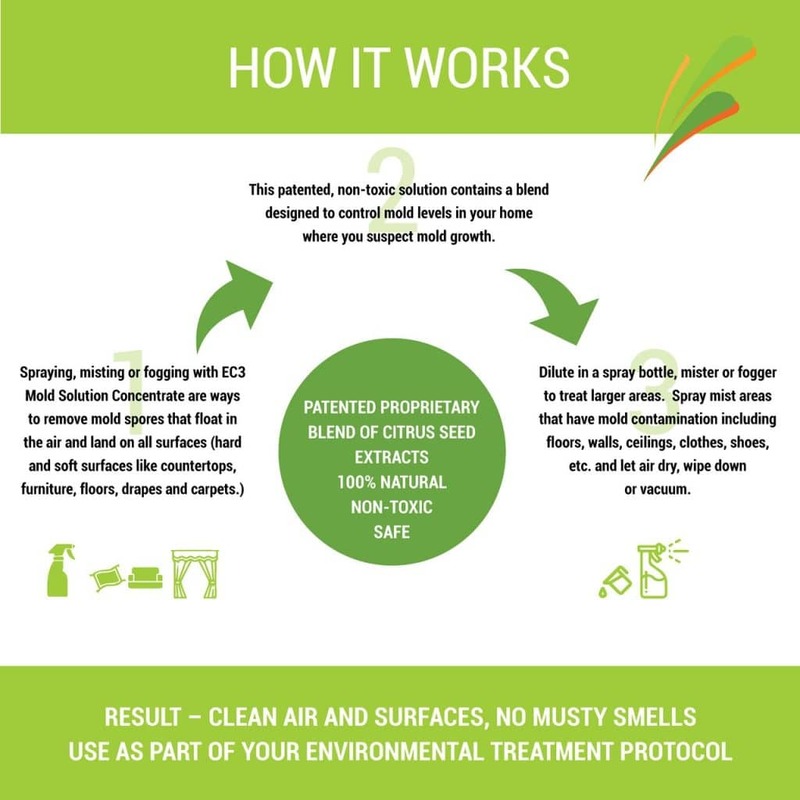 The solution contains a proprietary blend of citrus seed extracts with antimicrobial properties to effectively remove the mold spores that collect on the hard and soft surfaces of your home. 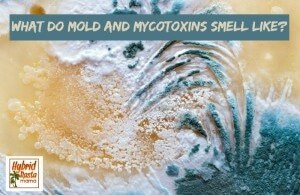 In addition, it inhibits new mold growth. This product is a recommended and proven part of the Environmental Treatment Protocol, developed by Dr. Don Dennis, for sufferers of Chronic Sinusitis or other mold related disease. This product is safe for all materials, surfaces and fabrics. This product is safe for children and pets, does not off-gas, contains no harmful chemicals and is not toxic. I do cover my fish tank when I spray and I shuffle my bunny, cat, and dog into another room since I don’t want them to get a direct hit. 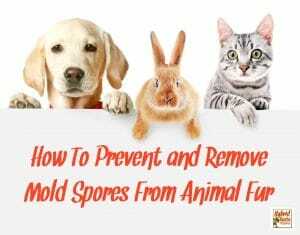 I have had no issues with my pets being exposed to this solution right after fogging. 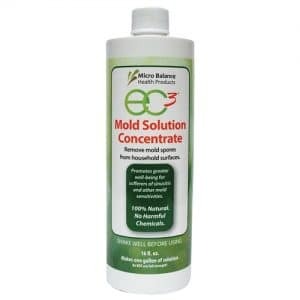 EC3 Mold Solution Concentrate comes in a 16 ounce bottle, and once properly diluted, makes 1 gallon of cleaning solution. One bottle of EC3 Mold Concentrate will fog a 4000 sq. ft. home 6-8 times making it VERY cost efficient. Important to note – While not a replacement for mold remediation, EC3 solution used in the fogger provides a temporary safe environment. I have tried a few different foggers but honestly there are only two that are worth your money and time. Both of these work great and require no skill and very little patience. Some of the other cold foggers I used drove me right up a wall! 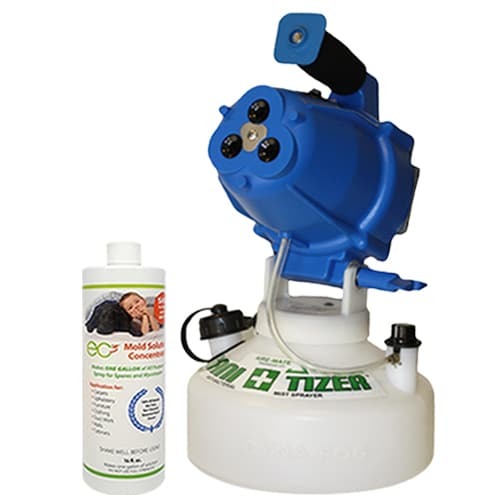 This fogger is the first ULV (Ultra Low Volume) sprayer specifically designed to efficiently apply antibacterial, deodorizing, and mold abatement solutions. DynaFog Sani-Tizer is made from a durable and lightweight plastic material with a VERY sturdy rubberized handle making it easy to move around. The low profile tank design virtually eliminates tipping…empty or full. This is a big deal. Trust me. If you need to use the fogger statically it provides a tilting option to position the head of the fogger. To lock the head in position there is a locking knob on the side of the fogger. Thanks to this mechanism the fogger can be used in multiple angles for more precise spraying. The flow rate of Sani-Tizer ULV fogger can be adjusted from 0-4.5 gallons (0-17 l) per hour. This fogger will output droplets from as small as 5 micron range, which is basically a fog up to 50 microns of fine mist. 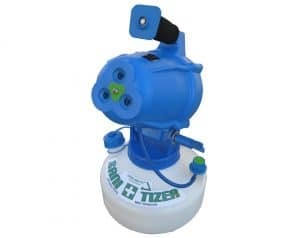 The Sani-Tizer fogger has three precision nozzles located on the front of the fogger and produces a precise stream of mist that covers a large areas quickly. You can purchase the Sani-Tizer on Amazon BUT BUT BUT it is crazy expensive. Read on for a bundle deal that gets you this fogger for about half the price should you choose to go with this model. This was the first fogger I ever tried and have to say it is one of the best delivery systems I have found for the EC3 Mold Solution Concentrate. 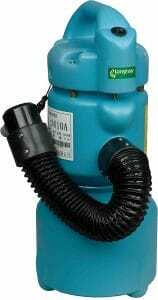 The Longray Basic ULV Fogger is designed to be picked up and carried around for manual, directed spraying. The bottom of the unit is a generously-sized, detachable solution tank with an easy-fill valve and a capacity scale. 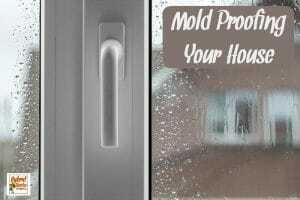 The top of the unit is molded into a grip handle so you can take your fogger anywhere. It is a genuine fogger. Foggers competing in this price range are often mislabeled misters. WHO guidelines define a particle finer than 100 microns as mist, and finer than 50 microns as fog. The Longray Basic is a genuine fogger, producing a 5-50 micron fog that diffuses faster, penetrates better, and has a higher probability of coming into contact with small particles like mold spores and mycotoxins. The unit’s vortex nozzle is designed to be clog-resistant and after using it for 2 years now, I have never experiences any issues with it. You can purchase this fogger on Amazon. It is usually under $200.00. I like to put either fogger on the “finest mist” setting. This offers the most coverage without saturating everything. I literally spray everything in my home. The mist is so fine that I haven’t had any problems spraying electronics with it. It doesn’t leave things wet on this setting. Not only do I spray all the furnishings, I spray the counters, walls, ceilings, floors, window coverings, beddings, inside closets, etc… I also spray inside each air vent. For this, I actually keep it on mist but turn it up a notch so it is a little more concentrated and can shoot a little further. 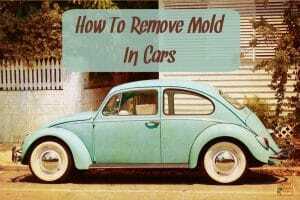 Since vehicles can become easily contaminated, I use my mold prevention and mycotoxin removal protocol in my car as well. It takes about five minutes with the fine mist and my car feel wonderful afterwards! 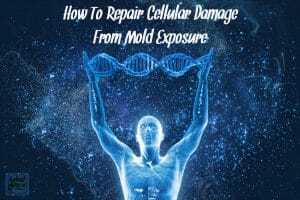 Here is the bonus to using this mold prevention protocol. 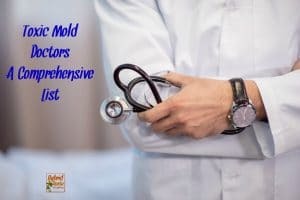 EC3 Mold Solution Concentrate has been independently lab tested by Real Time Laboratories (the leader in mycotoxins and mold toxicity) and shown to eliminate mycotoxins if diluted to no greater than 1:40. This is huge. NO other product on the market has been proven to do this. Not only do you get more bang for your buck but you get piece of mind that you are keeping your home and yourself healthy. Looking to save some money? Grab the EC3 Mold Solution and Fogger Bundle. This is a great deal if you want to purchase two products in one place! 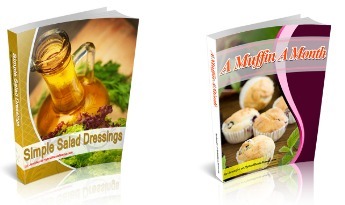 You can order this bundle here. 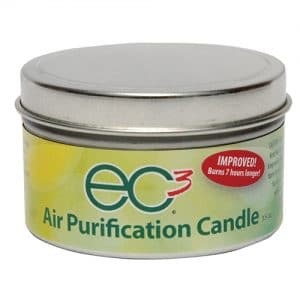 If you are looking for something to use in between monthly treatments, I highly recommend the EC3 Air Purification Candles. As an EC3 Candle burns, the heat from the flame aerosolizes and disperses an all-natural, antifungal ingredient embedded in the soy wax into the air. The candle reduce mold counts by more than 90% in 3 hours. That is HUGE! Additionally, independent lab tests demonstrated EC3 Candles denatured Mycotoxins. Each candle has a burn life of approximately 22 hours. The candles have no added fragrance, so as not to aggravate chemical sensitivities that are common in sinusitis sufferers. I like to burn these around my house every week, just to ensure that no mold spores take root. So far so good! And there you have it! 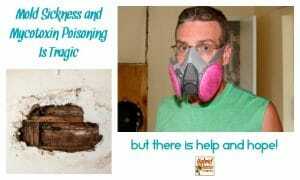 My easy monthly mold prevention and mycotoxin removal protocol. Give it a try. You will be blown away at how good you feel after using this protocol. « Is CBD Oil Right For Me? Very interesting! 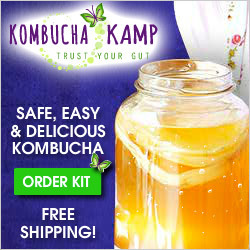 I was wondering if you regularly test levels before and after your monthly home treatments and what the results show. Thanks! We for sure have black mold in our shower. I scrub it and it stays away for a month or two but comes back. Any thoughts on how to get rid of it to begin with so I can maintain with your system described in your post? Thank you! Hi Jenn! Shower mold is a beast unto itself. I would actually use the cleaner I mention in this post. Get the concentrated solution and pour it directly on the mold. Let it sit there for an hour and then scrub it with baking soda. Make sure you have a really strong sponge. This ought to do the trick! I so appreciate your mold posts. I have two questions.. First, will this treatment you describe in the post also remove bacteria and fungus from the home as that’s a problem I’ve faced. And second, I am very sentive to citrus, especially citrus essential oils, does this cleaner have a strong smell to it? I can’t thank you enough! Hi Hannah! I personally do not think this has a strong smell. I am very sensitive myself. I typically leave the house for an hour after doing the spraying just so I don’t disturb the air and things can settle into place. When I return I don’t smell anything at all. 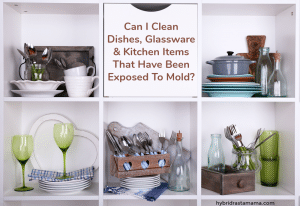 I have been sick for years and have come to suspect mould in my house to be the culprit. 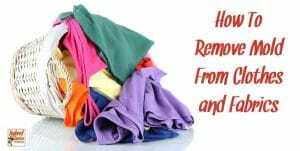 I have been reading up on the issue and many people are saying you need to leave your home, find a new place and take only uncontaminated belongings with you. This is a terrifying proposal to me and I feel crippled with the size of such an undertaking. If I used the fog machine to fog my entire house inside and all my belongings would that kill the mould sufficiently?? My advice to everyone is to try my method outlined in this post. 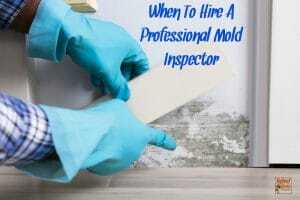 It will ONLY help if you remove the actual source of the mold like a water intrusion. 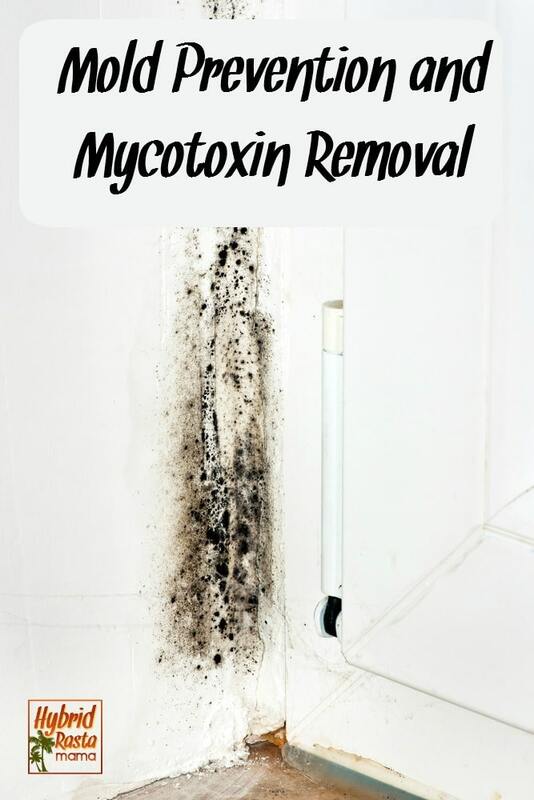 If you have visible mold, the material it is growing on should be completely removed (like if it growing on a wall for example). 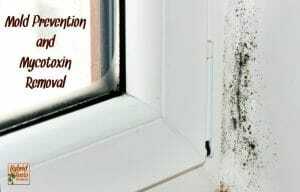 If you do not have visible mold and cannot locate the source but know it is making you sick, it might take several foggings but it should help to some degree. Me toio!! Pkease help??? We rent and have 7 cats. I dont know how to afford another set of rental bills just to get out!! And it is killing us –physically– literally. I dont know what to do!!! 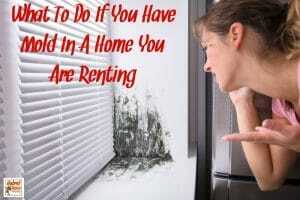 Do you have visible mold that you have made your landlord aware of? By law, they have to remediate. It gets a little tricky if you do not have visible mold. You should absolutely use this method. I would spray every day for 7 days. Get into every nook and cranny that you can. Put all the cats in a bedroom and then spray the rest of the house. It dries really quickly so once it is dry let them out and do the room they were in. Are you using air purifiers at all? So with the fogger, you just spray it all around your home…. and that’s it? Do you have to vacuum anything up? We have just learned that we have mold (somewhere) in our home which has been causing all the health problems I have been dealing with for the past year and a half. Thanks for all the information you have shared on your site. Hi again! Yes, just spray and walk away. Super easy! The fogger I link to has an ultrafine mist setting which I love. It allows the solution to dry in minutes. I usually spray the house twice in a row. I start in the back and work my way up then head to the back and do it again. Do reach out with any questions of if you need support! I am happy to help!